Our recipe for Christmas mincemeat for these festive gluten-free treats gets tastier the longer you leave it. Make ahead of time and leave to macerate for up to two weeks. 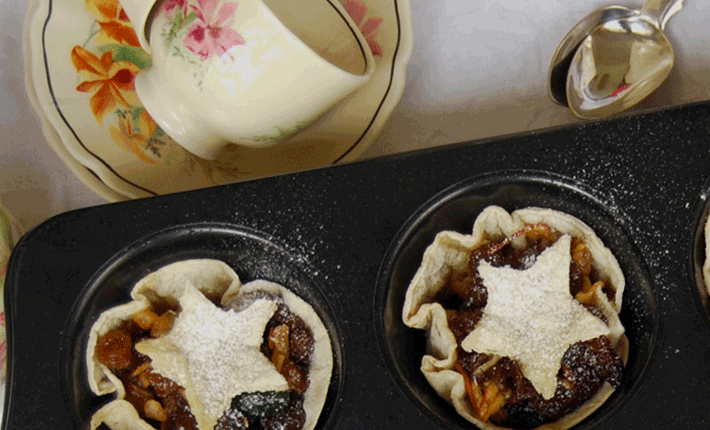 The mince pie casings and stars can also be made ahead and put in airtight container for up to a week. Assemble just before eating to avoid the casings going soft. May be heated before serving. 2 packs of Go Low Carb Wrap (for low-carb option using round-shaped cookie cutters for pie casings). Mix all the ingredients together in a big bowl and cover. Leave to macerate for up to two weeks if using alcohol. If using lemon juice only, refrigerate for up to a week before using. Brush Corn Stars with a little water and heat each one in your sandwich press until soft and bendy (about 7 secs). If using Go No Gluten Wraps or Go Low Carb Wraps, use a round-shaped cookie cutter to press out your cases. Go No Gluten Wraps should also be heated first in the sandwich press to make soft & bendy. While still hot from the sandwich press, gently push each Corn Star or Go No Gluten wrap into a patty pan tin. If your pie casings are made of Go Low Carb Wraps; don’t worry about heating them first as they will be soft enough to press in. The gluten-free casings will harden as they cool. For extra-stiff casings and for the Go Low Carb Wraps’ casings, heat in the oven for around 10 mins, keeping a close eye on them so they don’t burn. When ready to serve the pies, put a heaped teaspoon of mincemeat into each casing taking care not to overfill. To make the stars for the tops, use a star-shaped cookie cutter & place one on top of each pie after heating in your sandwich press first (for Corn Stars or Go No Gluten Wraps casings) or just before serving them or warming them in the oven for 10 minutes at 200C, watching they don’t burn. Remove from the oven and place on serving plates. Dust with a little maize cornflour or icing sugar for a festive wintry effect.